Dal Makhani is one of the Punjab’s most popular dishes. Traditionally this Dal is a combination of whole urad and Rajma (red kidney beans) and cooked on low flame on charcoal, for hours which gives it flavor and rich creamy texture. 1. 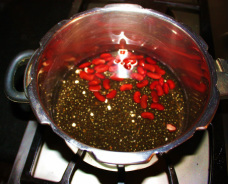 In a pressure cooker add dal and kidney beans and wash, changing water several times until the water appears clear and then soak it in 5 cups of water over night or at least few hours. 2. Once Dal and beans are soaked, wash and rinse the Dal and beans. until steam goes down. Different brand of cooker require different time to cook. 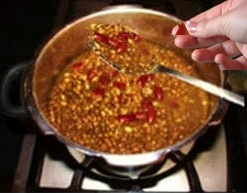 ​ add some water and cook for 5 to 6 minutes or until dal and masala blend well. 10. 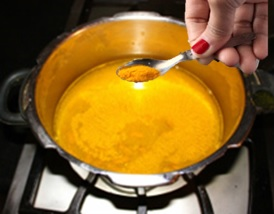 Add cumin seed tadka and mix and cook for a minute or untill you have the desired consistency. Turn the stove off. ​ for too long because dal tends to get thick quickly. is added at the end when is ready to be served. 1. Cook dal in pressure cooker other wise it takes too long to cook dal. 2. 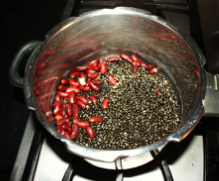 Urad dal generally takes long time to soak most of the time we do not preplan to make the dal and have much time to soak it, but do not get discourage it just take little longer to cook dal, or use power soaking method. 3. If you are not adding Kidney beans (Rajma) then you do not need to soak overnight, just cook the Dal little longer.